The Old Bailey Online celebrated its tenth birthday this month (15 April 2013) after attracting over 34 million page views since it went live in 2003. The searchable archive of proceedings from the Old Bailey trials from 1674 to 1913 has been used by scholars, students and the general public over the past decade to uncover multiple hidden histories. Old Bailey Online has so far had over 34 million page views, more than 5 million visits and 3.5 million unique users from all over the world. The website also provided the inspiration for the three series of the BBC One award-winning drama Garrow’s Law and the Radio 4 series ‘Voices from the Old Bailey’. The founders of the Old Bailey Online, Professor Robert Shoemaker (University of Sheffield) and Professor Tim Hitchcock (Hertfordshire University) were awarded the Longman-History Today Trustees Award for their major contribution to history. The award was given for the ground-breaking Old Bailey and follow-up London Lives projects that point the way to the future of the discipline. Funded by the Arts and Humanities Research Council and the National Lottery, the Old Bailey Online was developed at the Humanities Research Institute at the University of Sheffield. Since its completion the same project team have added two new resources to widen its reach. 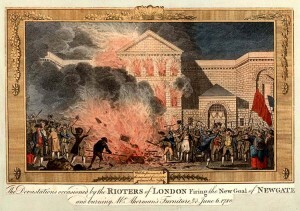 London Lives, released in 2010, contains records relating to crime, poverty and social policy in eighteenth-century London. This fully searchable resource provides access to over 240,000 manuscripts from eight archives and fifteen datasets, giving access to the names of 3.4 million Londoners. Locating London’s Past, launched in December 2011, allows place names from the Old Bailey Proceedings to be mapped onto John Rocque’s 1746 map of London and the first accurate modern Ordinance Survey Map (1869-80). A pioneering online historical resource, the Old Bailey Online has inspired countless other online projects. It is also included in several larger web resources, including Connected Histories, a search interface for twenty-two online historical databases. This entry was posted in News and tagged AHRC, BBC, digital humanities, HRI, Locating London's Past, London Lives, Old Bailey, online resource, Robert Shoemaker on November 6, 2013 by James Pearson.